Start by making sure the ground has been prepared well including rototilling the soil, raking the area smooth and then compacting the soil with a half filled water filled roller. Water the soil to help settle it and then repeat the smoothing and rolling. Your grade should be ¾” below any adjacent concrete. Have your sod delivered in the morning of installation day from your local sod farm. Water the area to be sodded the day before so that it is moist to a depth of about 6 inches. Apply 16-16-16 fertilizer (1 pound per 100 sf) on top of your rolled finished grade. Apply lime at 5-8 pounds per 100 sf. 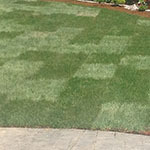 Install your sod beginning against the longest straight edge and work toward any irregular boundary. Try not to use small pieces of sod, they won’t take root as well as larger ones. Fit the pieces together snugly. Stagger pieces so the sod seams don’t line up. When working around trees or garden areas, use a very sharp knife to cut the sod into shape. As you install the sod, keep the ground and sod moist with light periodic watering. Roll the sod with a half full water filled roller to flatten all seams and better help the sod to take root. Water your new lawn regularly to keep from drying out. It should be ready for its first mowing in 7-10 days. When is the best time of Day to Water Your Lawn?